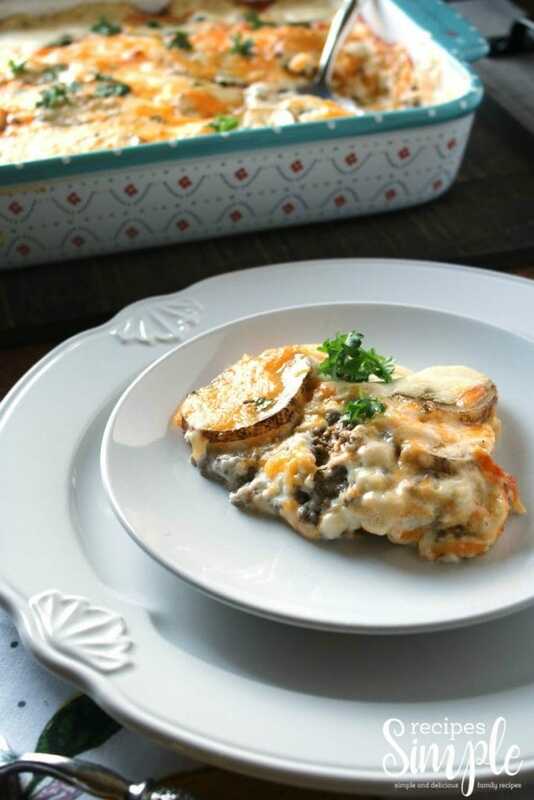 Hamburger Potato Casserole has the classic meat and potato taste with a nice creamy sauce and cheese that really completes the dish. Makes a delicious and easy dinner. 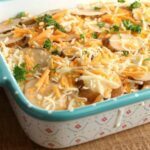 I am a huge fan of casseroles as they are easy to make and great for taking to potlucks and delivering to friends and family. 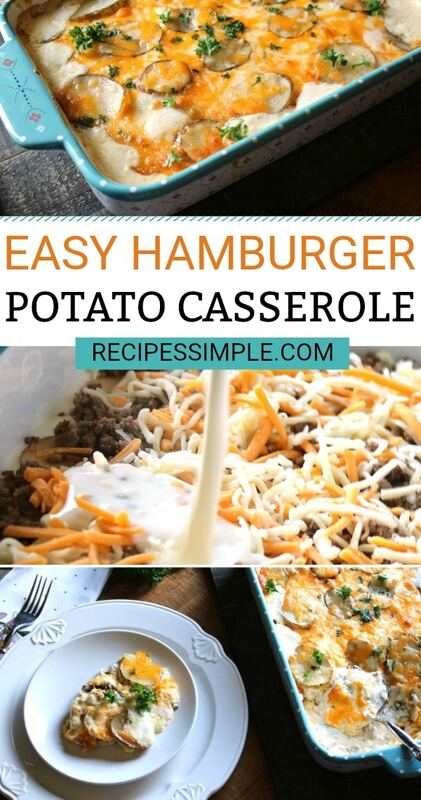 This hamburger potato casserole is not only delicious but also very easy to make, and the leftovers are divine. 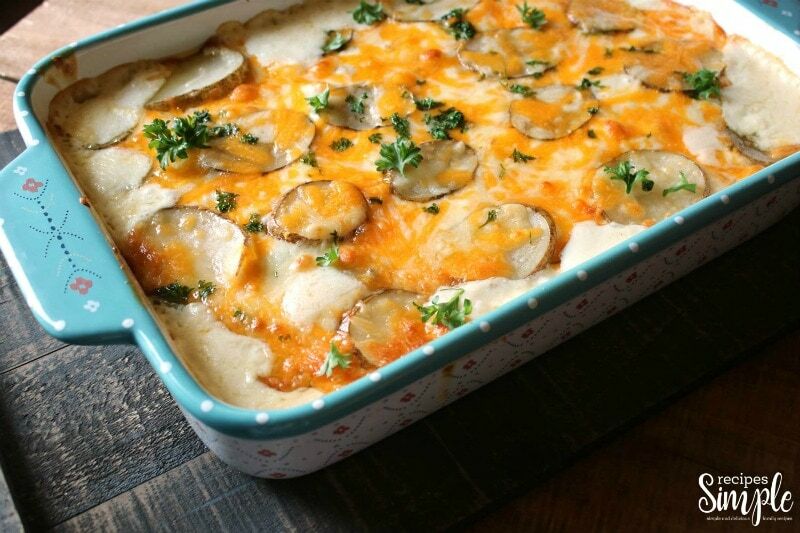 You have that classic meat and potato taste with a nice creamy sauce and cheese that really completes the dish. 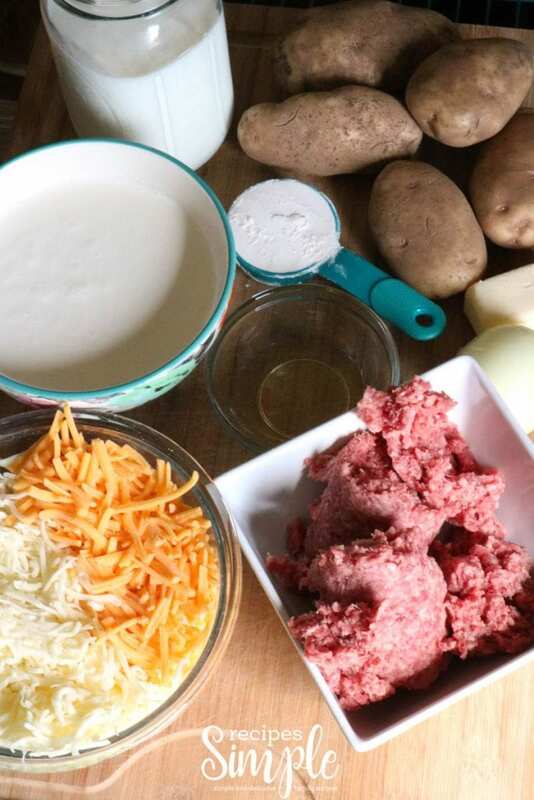 This delicious hamburger potato casserole will quickly become a family favorite and a part of your meal rotation for quick and easy meals. 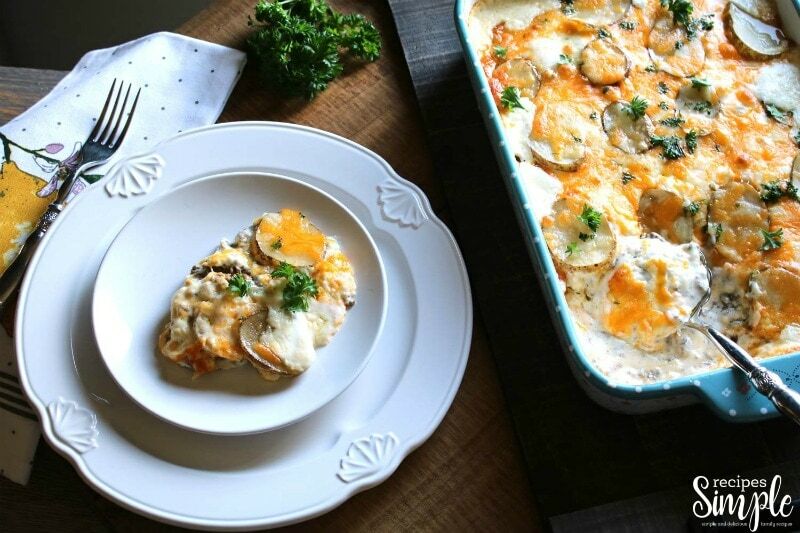 What is so nice about this dish is you can eat this alone or serve with a crisp green salad or side of green beans and you have a savory dinner ready in no time. 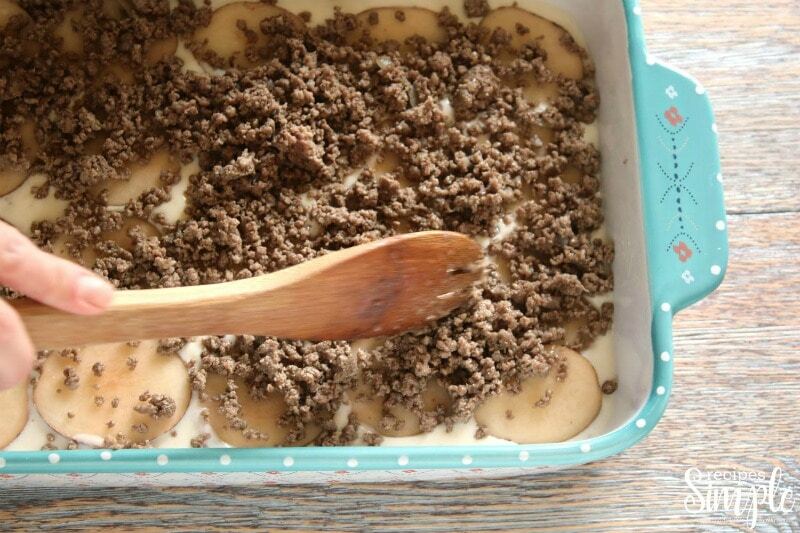 Gather your ingredients to make this delicious casserole. 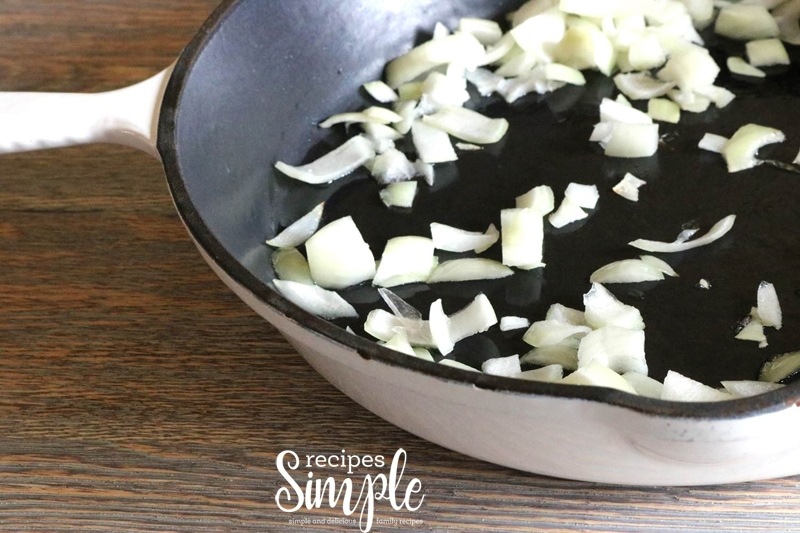 First off you start by heating a skillet and adding your onions and cooking until it is tender. Then add your ground beef and cook until it is all brown, and drain the grease. Then in the same skillet, you want to add in the butter and melt it. Follow it by the flour, and whisk to make a roux. Then slowly mix in 3 cups of milk and add the cream. Simmer on low for around 10 minutes so the sauce can thicken. Season with salt and pepper. Pour a little sauce in the bottom of the 9×13 pan and start alternating layers of potato, onions, ground beef, cheese, and sauce. Aim to make 2-3 layers of each. 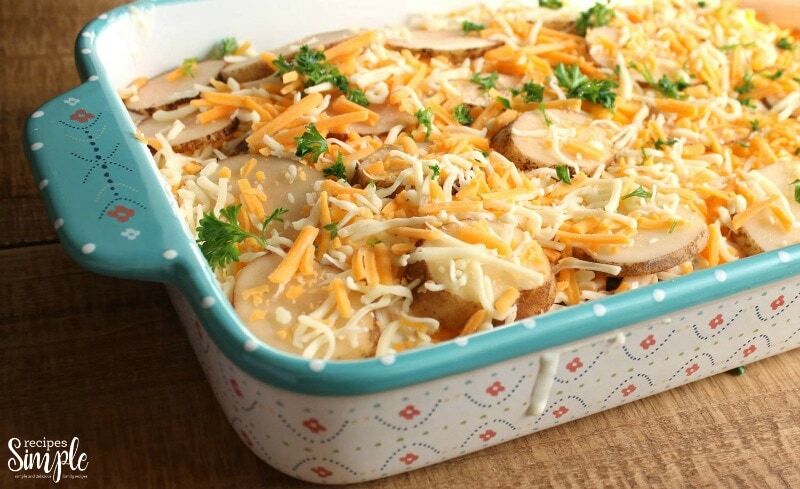 Reserve some of the cheese to add to the top of the casserole. Place in a preheated oven and bake for 45-55 minutes or until you can stick a fork into the potatoes and they are tender. 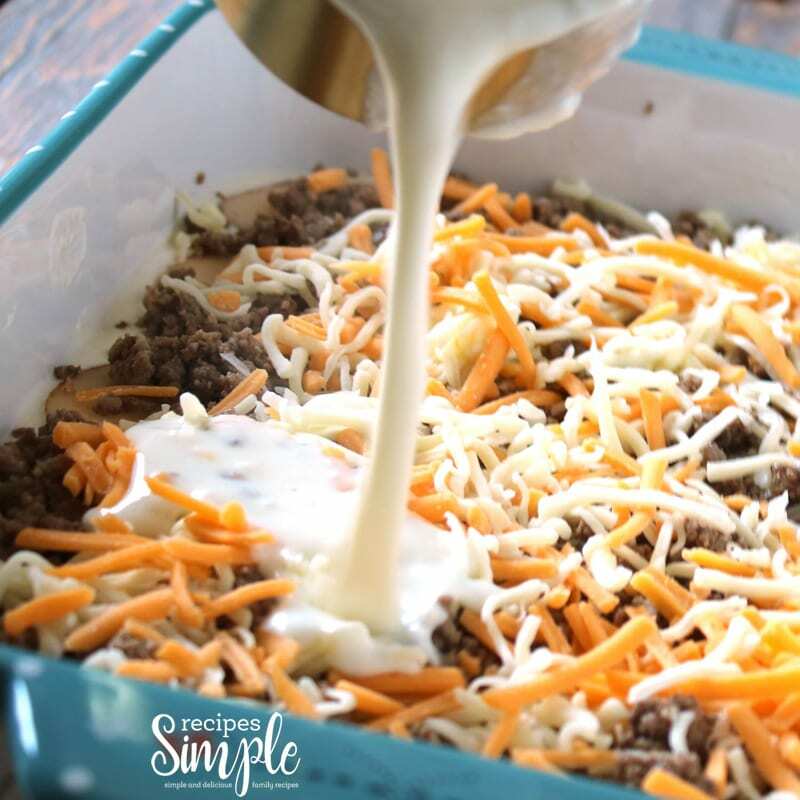 Hamburger Potato Casserole has the classic meat and potato taste with a nice creamy sauce and cheese that really completes the dish. Delicious and easy dinner. Heat oil in a large skillet over medium heat. Cook and stir onions until tender; set aside. 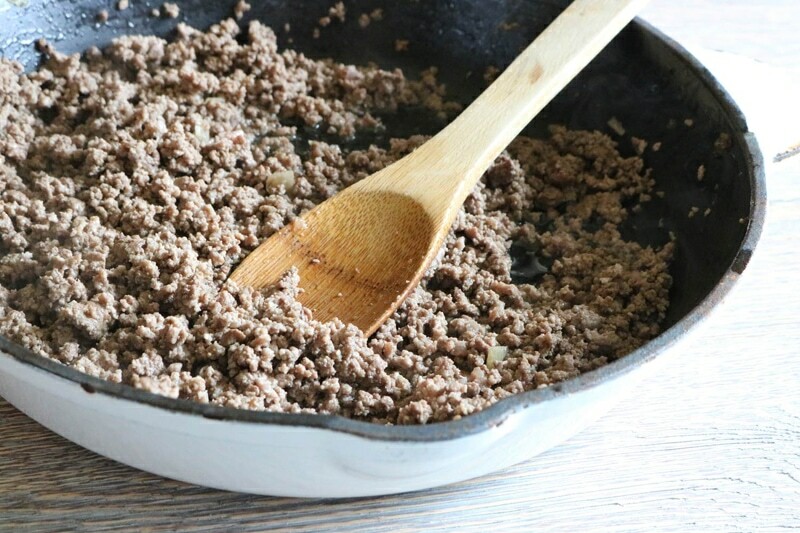 Cook ground beef until evenly brown and then drain excess grease. Set aside. Using the same skillet, melt butter and then add flour. Stir with a whisk to combine, making a roux. 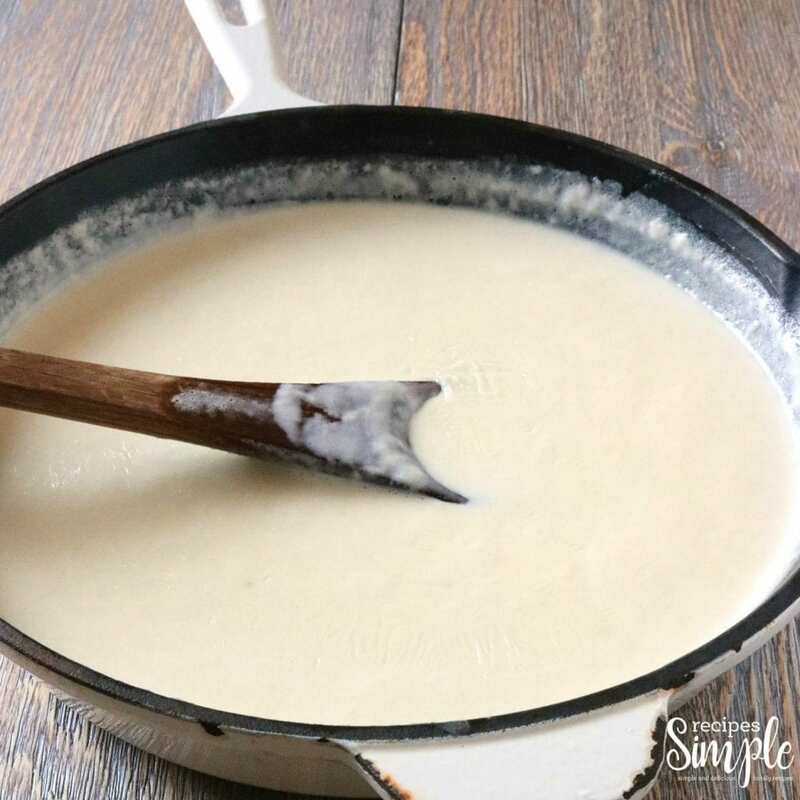 Gradually whisk in 3 cups of milk and then add in the cream. Simmer while frequently stirring over medium-low heat for 10 minutes or until the sauce has thickened. Season with salt and pepper and remove from heat. To prevent sticking, spread a small amount of sauce in the bottom of a 9x13 baking casserole dish. Alternate layers of potatoes, onions, ground beef, cheese and sauce, making 2-3 layers of each. Reserve some cheese to sprinkle over the top of the casserole. 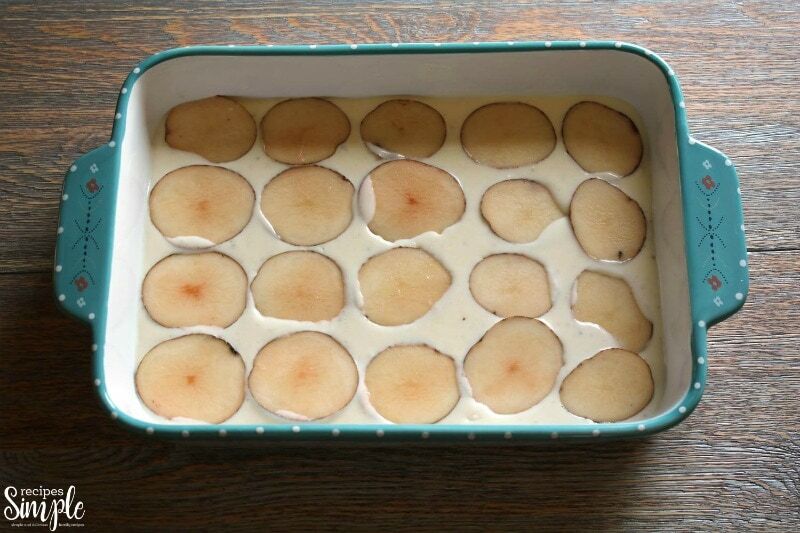 Place in preheated oven and bake for 45-55 minutes, or until potatoes are fork tender.